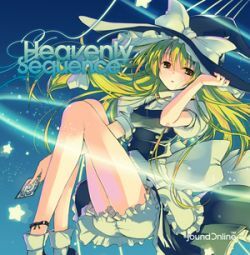 Instrumental versions for Tracks 1-01, 1-02, 1-04 and 1-07 can be found on [IBCD-9001] Heavenly Sequence Promotion Disc. 1-05. Touhou Yumejikuu / Strawberry Crisis!! Touhou Yumejikuu ~ Phantasmagoria of Dim.Dream. / 東方夢時空　～ Phantasmagoria of Dim.Dream. / Touhou Yumejikuu ~ Phantasmagoria of Dim.Dream. Touhou Rei'iden ~ Highly Responsive to Prayers. / 東方靈異伝　～ Highly Responsive to Prayers. / Touhou Rei'iden ~ Highly Responsive to Prayers. Touhou Gumon Shiki ~ Perfect Memento in Strict Sense. / 東方求聞史紀 〜 Perfect Memento in Strict Sense. / Touhou Gumon Shiki ~ Perfect Memento in Strict Sense.